Genetics can be used for the prediction of a schizophrenia patient’s response to antipsychotic drug treatment, according to a new study. The study, published in the American Journal of Psychiatry finds that patients with higher polygenic risk scores (PRS), also called genetic risk score, for schizophrenia tended to have less improvement with antipsychotic drug treatment. PRSs derived from genome-wide association studies (GWAS) can quantify the influence of thousands of common alleles of small effect in a single measure. 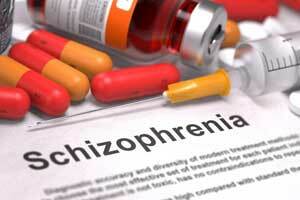 Schizophrenia is one of the leading causes of disability in the U.S. It is characterized by delusions, hallucinations and disorganized thoughts and behavior. The condition is currently treated with antipsychotic drugs, but this therapy is given without guidance from lab tests to show effectiveness, as is common in other areas of medicine. Doctors often use “trial-and-error” when choosing a treatment for schizophrenia, without knowing if patients will respond well. This uncertainty places a large burden on not only patients and their families, but also health care professionals and health care systems. Jian-Ping Zhang, assistant professor at the Feinstein Institute, and colleagues conducted the study to determine whether PRSs for schizophrenia were predictive of antipsychotic efficacy in four independent cohorts of patients with first-episode psychosis (total N=510). “Polygenic risk scores represent the combined effects of many thousands of genetic variants across the entire genome, and better represent the very complex genetic nature of schizophrenia,” said Zhang, assistant professor at the Feinstein Institute and lead author of the study. The PRS threshold set at a p value <0.01 gave the strongest result in the discovery cohort and was used to replicate the findings in the other three cohorts. Higher PRS significantly predicted greater posttreatment symptoms in the combined replication analysis and was individually significant in two of the three replication cohorts. Across the four cohorts, PRS was significantly predictive of adjusted 12-week symptom scores (pooled partial r=0.18; 3.24% of variance explained). “The results we found open the door for ‘precision medicine’ approaches to psychiatry, and more specifically, the use of polygene scores as a new technology for the treatment of psychiatric disorders,” said Feinstein Institute professor Todd Lencz.